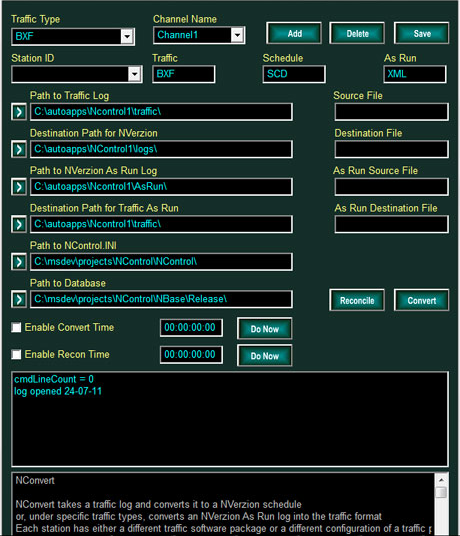 NConvert is part of NVerzion's suite of products that converts information from third-party traffic systems for use with NVerzion automation – in this case a traffic and scheduling system. Most common traffic systems have some custom functionality associated with them that require custom code or custom configuration. NConvert acts as the bridge between your NVerzion system and these customized requirements to ensure your system handles all the required parameters and interfaces appropriately, every time. For example, even the BXF standard, which is becoming increasingly popular, has not been treated as "standard" by everyone, as it’s been implemented and interpreted differently depending on the application. NConvert helps users overcome these disparities. NConvert is operated with an intuitive GUI, which is used to enter in the required parameters and implement the desired task. For example, automatic convert times and automatic reconciliation can be enabled to happen at a specific time each day. NConvert can also be operated via NVerzion's NControl.